*** UPDATE *** An additional class has been scheduled starting 2 June 2018 too! Come along on a 6 week journey of creativity and relaxation. Each week you will learn new techniques and tangles (patterns) using the Zentangle Method. This class is suitable for complete beginners and for those with more experience. Everyone enjoyed the last class which ended with meeting up for a lovely lunch on the last day. Lots of fun and new friendships were made. Where: At my studio in Gymea Bay, Sydney. Address will be sent as soon as you have reserved your place. Cost: $169 for the whole course OR $35 each week (pay-as-you-go). Plus $12 for a Mini Kit. If you already have one please bring it along, to save purchasing another. (Note: if you have never done a Zentangle Class before please make sure you come to the first class). 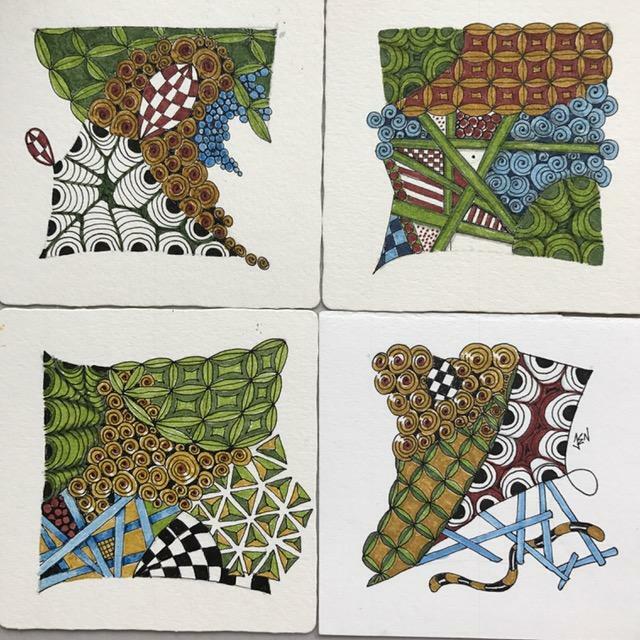 Announcing a special Renaissance Tile Class for those who have previously completed an Introduction to Zentangle Class. Where: At my studio in Gymea Bay, Sydney, address will sent as soon as you have reserved your place. Cost: $35 per person + equipment. If you have the equipment please bring it along on the day to save purchasing more than you need. The class is limited to 8 people and is suitable for those who have completed the Introduction to Zentangle class. Look forward to seeing everyone again! It’s week 4 already! The 6 week Zentangle Workshop is flying past so quickly. I just had to post a picture of the beautiful artworks that my students produced this week. Everyone was challenged with “ellish” and they conquered this interwoven tangle. Each week I am so impressed with the way everyone has grown in their Zentangle journey- it’s such a pleasure to be part of the journey. Just finished these tiles and added some colour with Fabre-Castell artist pens. These designs are going to start my colouring book designs. Colour will be introduced at a workshop coming soon. Becoming a Certified Zentangle Teacher (CZT) has been such a rewarding experience and I’m so grateful that I had the opportunity. I was asked recently what I had to do to become certified. I answered that I did a 3 day course. Later I reflected on my answer and I realised that it has been a long journey. I should have answered that my interest in art and patterns started during my Bachelor of Arts degree, then developed through my art practice. A couple of years later I travelled over 16,000 kilometres to Providence, Rhode Island to learn the art of the Zentangle Method directly from the founders Rick Roberts and Maria Thomas. The obstacles on that long journey took on a life of their own (including losing my suitcase along the way!) Since becoming certified I participate in workshops by other CZTs and CZT groups where we share our ideas and develop new tangles. 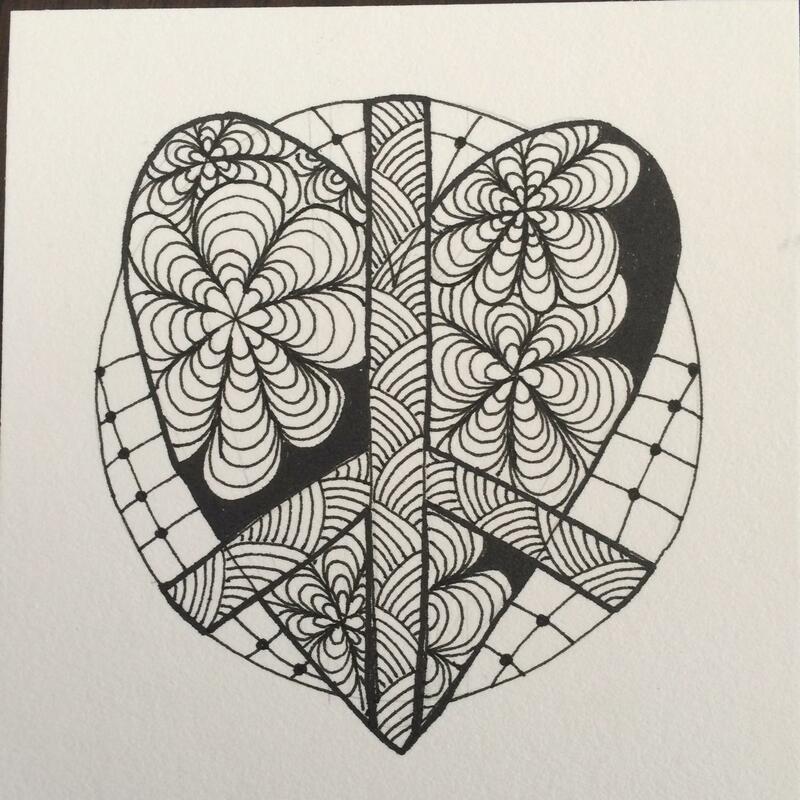 The learning never stops – I am still developing as a Certified Zentangle Teacher. I’d like to take the opportunity to express my gratitude and thanks to everyone who has done a workshop with me. I do hope that you’ve been inspired to grow on your artistic journey and persevere regardless of any obstacles that sometimes appear. Obstacles and challenges are a normal part of our lives and they help us to grow into who we are. So often I reflect on them and realise that if I had not been presented with a particular challenge or obstacle then I would have missed out on an opportunity which enriched my life. The Zentangle method reminds us that when we are presented with a challenge in our art or what we ‘perceive’ to be a mistake, this gives us the opportunity to go in another direction and draw something even better than we would have produced. It makes me grateful rather than regretful of the challenges that come my way. I am at home today, too unwell to go to work. I have been so busy with helping my mother and my brother (who live in UK) and trying to learn my new job to the point of exhaustion that I’ve had no time for my myself or my art. So I’ve turned to Zentangle for the first time in weeks and I’m grateful for the opportunity today. 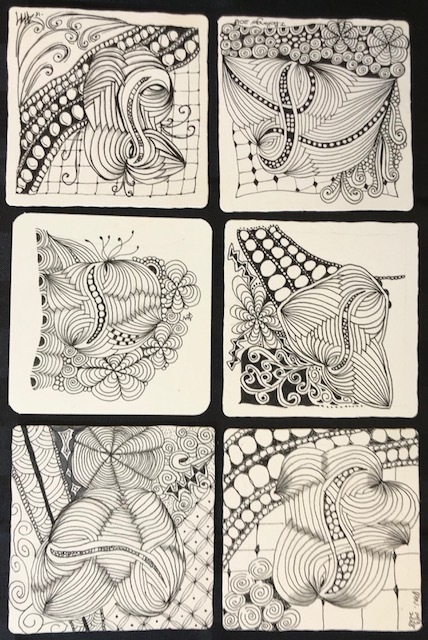 The Zentangle Method begins with gratitude for the opportunity to be creative and for the simple, beautiful art materials (tile, pen, pencil, tortillion). Then It ends with gratitude and appreciation. Gratitude is the foundation. This week’s Diva Challenge‘s theme is “Give Peace a Chance” after the events in Dallas this week. Let’s all pull together to spread world peace and love. The challenge was suggested by Suzanne Fluhr CZT as Laura Harms is taking a well deserved break with her family. I’ve been experimenting with watercolour recently. These tiles were made by starting with watercolour on the tile. I used my Windsor & Newton travel watercolour set which I usually carry around with me. After laying down the colour I used a variety of methods to produce tangles (or patterns) on the tile. With coloured pens I traced around the edges of some of the watercolours and then then used a brown or similar coloured pen to draw tangles between the colours. I loved the effects and I’m going to practice more using this method.